Paris is undoubtedly the leading tourist destination. The city has maintained this status for several years and has done everything to welcome tourists from all over the world. Paris is wonderfully connected with its public transport system with the rest of Europe. Paris is famous for its numerous landmarks which were created by different eminent personalities defining their ages and the culture. On the other hand the lesser known Paris is also remarkable with its offerings and tourists are rewarded in various ways. The leading fashion destination, Paris draws millions of tourists each year. Exploring Paris is an experience in itself. It is the city of romance and love. Paris is home to thousands of museums, parks and churches. There are big and small parks in the city beautifully decorated. 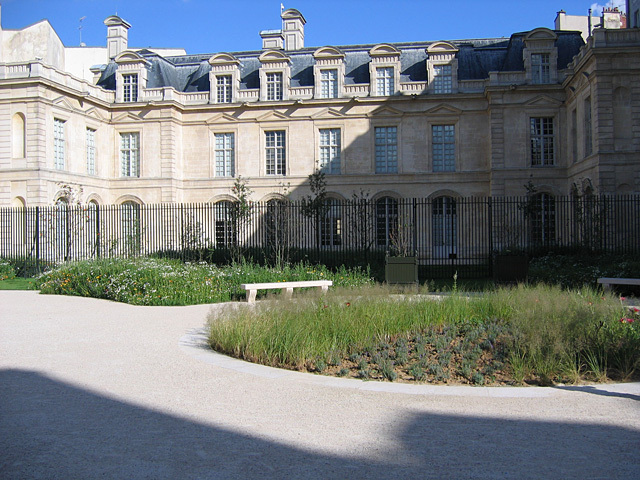 One such park is the Jardin Saint Aignan in Paris. This park is not located at the center of Paris; rather it is tucked away at the end of a small cul-de-sac. This can be found in the Temple district which is highly populated. Jardin saint Aignan covers an extensive area of 4000 square meters and is an absolutely fantastic tourist spot. This park was inaugurated in the year 2007. This spot where the park is situated now was formerly a hotel with the name of Hotel Saint-Aignan. The hotel building dates back to 1650. The hotel was refurbished and made into a part of the Museum of the Art and History of Judaism. The garden was associated with the hotel building when Paris had acquired the rights over the building in the year 1962. The adjoining land also came under the ownership in the year 1970. The garden is divided into 3 distinct parts. This vast stretch of greenery can be seen in 3 parts. At the entrance of the garden, the land is decorated in a contemporary style. The entrance also marks the end of Impasse Berthaud. This part is beautifully adorned with fragrant flowers like azaleas, hydrangeas and Japanese maple. However, the highlight in this part is the chestnut tree belonging to Anne Frank and her garden at Amsterdam. The middle section of the garden is dedicated to historic monument. This section is decorated following the designs of the garden of Hotel of Saint Aignan. This section consists a bower and the design belongs to the 17th century architecture which put greater stress on the mineral aspect. The last section of the garden is where visitors can walk or sit and spend their time looking and admiring the beauty of the fruits and flowers of the garden. The communal garden is created with allotments from the local residents and there is also a playground for children. This entry was posted in Basic Travel Tips for Travelers to Paris and tagged Exploring Paris, Hotel of Saint Aignan, Jardin Saint Aignan, Jardin Saint Aignan in Paris, travel. Bookmark the permalink.